BMW denies rumors of a dedicated storage business. But there’s plenty of other activity across the German auto sector. Carmaker BMW has denied German media reports of a business unit dedicated to energy storage. “We cannot confirm that the BMW Group has launched a new business unit that operates the sale of electricity storage systems,” said Wieland Brúch of the company’s corporate communications department. Last month the German business weekly Wirtschaftswoche said BMW was planning an entry into the energy storage market, with a 22-kilowatt-hour battery developed for the BMW i3 electric vehicle. BMW did, however, announce an energy-related partnership with Viessman Group, a German heating systems manufacturer, the week before the Wirtschaftswoche report was published. The two companies unveiled a joint venture called Digital Energy Solutions, pitching energy management systems at commercial and industrial customers in Germany and Austria. And in the U.S., the auto manufacturer has been experimenting with energy storage through a program called BMW i ChargeForward, which was announced in January 2015 and has been underway since last August. The 18-month pilot project is being run by the BMW Group Technology Office and North Californian utility Pacific Gas & Electric (PG&E), and involves 100 BMW i3 owners in the San Francisco Bay area. The pilot aims to see how much the owners can make by allowing their car batteries to participate in PG&E’s demand-response program for up to an hour every day. The array features a Geli Energy Operating System and Global Energy Network Interface software, a Princeton Power bidirectional inverter, Kaco New Energy solar inverters, and ChargePoint and ABB electric-vehicle chargers. Batteries for the project, which bagged an Energy Storage North America Innovation Award in October, were sourced through the vehicle-to-grid pioneer EV Grid. It is unclear whether second-life batteries will play a role in BMW’s current plans for energy storage in Germany. Meanwhile, another German auto firm, Daimler, has confirmed it is pressing ahead with residential energy storage plans of its own. 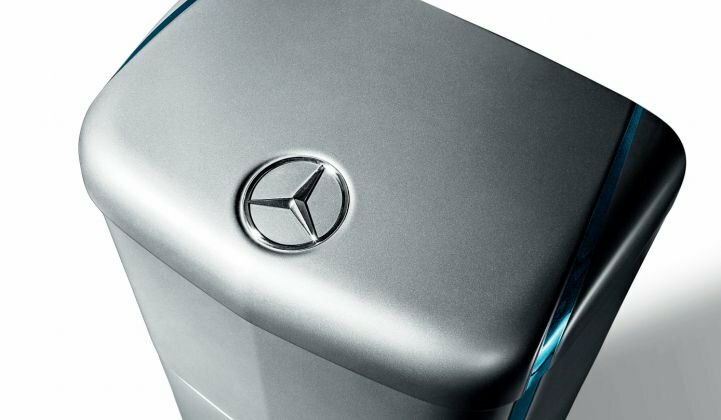 Daimler’s entry into the stationary battery storage market was announced through SMA Solar Technology, which is commercializing Mercedes-Benz branded 20-kilowatt-hour batteries from Daimler subsidiary Accumotive. The lithium-ion batteries are being paired with SMA Sunny Island battery inverters, plus Sunny Home Manager and SMA Energy Meter products for the consumer market. The technologies should allow the storage systems to react automatically to changing weather conditions. “Forecast-based charging…uses the integrated forecast to specifically charge the battery at times when solar irradiation levels are high,” said Volker Wachenfeld, the head of SMA’s off-grid and storage business unit, in press material. More than 180 installers across Germany have been trained to install the systems, which will be available in March, SMA said.